As an independent contractor, you know the rigors of paying for taxes. Itemized deductions time-consuming and often don’t fall in your favor when everything is said and done. That’s why the free 6 Tax Deductions for Independent Contractors is here to help you start saving money on your taxes. This convenient list has the best deductions for independent contractors to use. We even give you a detailed description of what you need and how you can use it. This template is just a fast and easy way to do your taxes the right way this year. 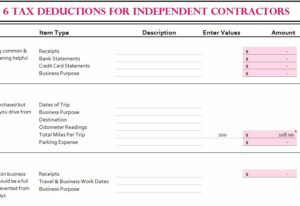 To get started with the free 6 Tax Deductions for Independent Contractors template, just follow the guide below. You can download the free template file by clicking the link at the bottom of this page. Start at the top of your opened document and take a look at how the information is setup. You have the name of the deduction in the first column of the template, the items associated with it, and spaces to enter a description and the price. We also provide you with a space to leave any details about the decoction that you think are relevant. Take the time to fill out all the required information in the indicated sections. Let’s run through an example to get you started. Let’s say you run your own ice cream truck and you have your own home office to do work out your bookkeeping. You would scroll down to the appropriate section, #5, and enter the information you have for the list of items. Using this template, you can actually keep the money you make. The free template was designed to help independent contractors feel like their winning this year!